Located in one of the oldest cities of India, Banavasi, the Madhukeshwara temple has religious and historical significance. During Mahashivratri people from across the country flock this temple to celebrate the festival. If you are touring Karnataka, you cannot leave without visiting this temple. Banavasi was the first capital city of Karnataka when it was ruled by the Kadamba dynasty. The city dates back to 375 AD. It has been mentioned in revered terms by Chinese traveler-monk, Huen Tsang, Greco-Roman writer, Ptolemy, Kalidasa and Chamarasa. 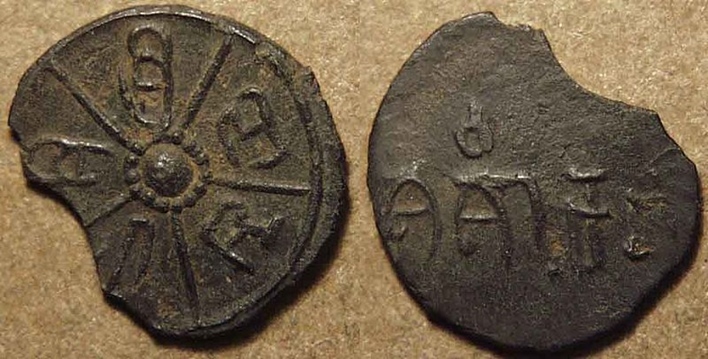 Over the years, it was given many different names; Konkanapura, Nandanavana, Vanavasika, etc. Today the main structure that remains is the Madhukeshwara temple. The Madhukeshwara temple gets its name from the honey-hued Shiva Lingam inside the sanctum. The temple dates back to the 9th century and hence is one of Karnataka’s oldest temples. It was commissioned by Mayura Sharma from the Kadamba dynasty. This was the first royal dynasty of Karnataka. After the Kadamba reign was the Chalukya era and the Hoysala period. Additions and renovations were made to the temple by rulers from both periods. Thus, in a way the temple showcases how architectural styles in Karnataka have changed over the years. A pair of stone elephants greets visitors to the temple. The main shrine of this temple or the Garba Mandapa has a very simple structure. It has minimal ornamentation in terms of carvings on pillars and walls. A honey-colored Shiva Linga is placed in this shrine. Under the reign of the Chalukya dynasty, a Sankalpa mandapa was added on to the temple. The construction of the Nritya mandapa is attributed to the Hoysala rulers. The Nritya Mandapa is a sharp contrast to the Garba Mandapa in terms of ornamentation. This ceiling, walls and pillars of this mandapa are exquisitely carved. The pillars bear the Hoysala trademark of reflective convex and concave carvings one below the other. This goes to prove the expertise of the stone carvers of that time. The temple also has 8 separate shrines for the Ashtathik Balahas, their consorts and vahanas. It is probably the only temple where this is seen. Inside the Nritya Mandapa is a 7-foot tall monolithic statue of the Nandi Bull. This is positioned in such a way that the left eye seems to be looking at Lord Shiva and the right eye is directed towards Parvati. What is interesting to note is that the line of sight has been created in such a way that the pillars do not intersect it. One of the highlights of this temple is an intricately carved stone cot and a triloka mandapa. This was made by the Sonde rulers. The cot sits in a separate mandapa within the praharam. This is not made with soft stone but with granite which is much harder to carve. The cot is made up of ten separate pieces. It is used during the Rath yatra festivals for the ashtavathama poojas. The triloka mandapa depicts Shiva and Parvathi in the centre surrounded by the Kailasa Sikara, Sesha lok and Bathala lok. Another unique attraction of this temple is a vertically sliced Ganesha idol. It is believed that the other half of this stone idol is in Varanasi. 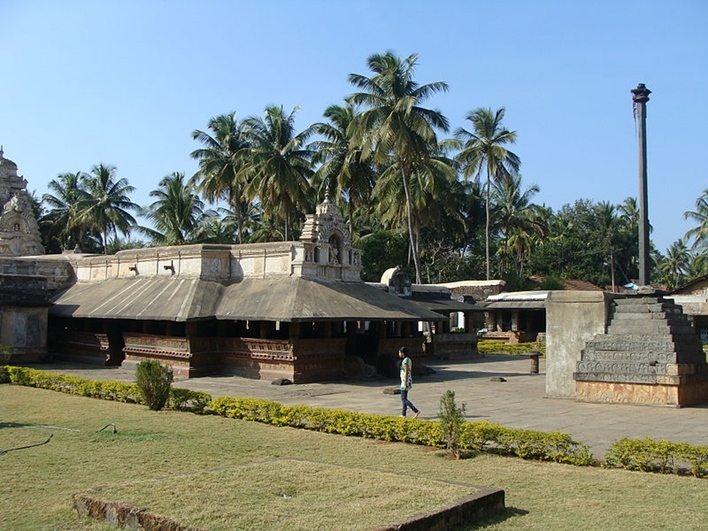 A few kilometres away from the Madhukeshwara Temple is a small garden known as Pampavana. The garden has a number of medicinal trees and plants. This is said to be where Kalidasa found inspiration for ‘Meghaduta’. The garden is also where Adikavi Pampa wrote a number of poems about Banavasi and the Madhukeshwara Temple. At a distance of a little over 250km, Mangalore is the closest airport. Tourists can choose to travel from Mangalore to Banavasi by bus or taxi. The closest railway station connecting Madhukeshwara Temple is at Shimoga. This is at a distance of 112 km. Madhukeshwara Temple in Banavasi is well connected by road. Karnataka State Road Transport Corporation runs buses between Bangalore and Banavasi regularly. Private buses and taxis are also available.